Lynard "Lyn" Ashley Johnson, 85, of Bladenboro went home to be with his Lord and Savior on Thursday, December 6, 2018. Lyn was a man who loved his country, his family and his community. But above all he loved his Lord. He was a faithful lifelong member of Zion Hill Baptist Church where for years he served as a deacon and a song leader. Lyn loved to sing. Every year he would call his children and grandchildren on their birthday and sing "Happy Birthday" to them. He also enjoyed farming, tending to his chickens and watching his beloved Atlanta Braves and Wolfpack on TV. Lyn was born on May 2, 1933 to Johnnie Bell and Lawrence Johnson. After high school he was drafted and served for 2 years in the U.S. Army as a specialist. He retired with the rank of sergeant from the NC Dept. of Correction after 30 years of service. Lyn was married for 61 years to the love of his life, Lola and together they raised four daughters: Tammy Lowrimore of Bladenboro, Joy Pozin (Jeff) of Cary; Paula Johnson of Cary; and Laura Johnson of the home. 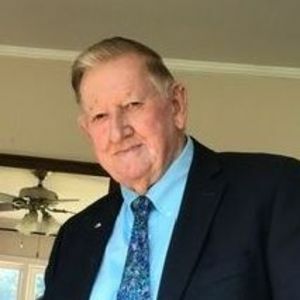 He is also survived by two sisters: Betsy Reep of Alabama; Mary Paul Kern of Lumberton; and sister in law: Alene Johnson of Bladenboro; six grandchildren: Joseph Hinson (Allison), Stephen Polzin, Robert Cagle (Crystal), Megan Polzin, Allec Johnson, and Rachel Polzin, three great grandchildren: Richard "Boo" Powell, Cheyenne Davis and Naomi Hinson and many nieces and nephews. He was preceded in death by his parents, his wife, one brother and one sister. The family will receive friends from 4-6 pm on Saturday, December 8, 2018 at Bladen Gaskins Funeral Home in Elizabethtown. A funeral service will be held on Sunday, December 9th at 2 pm at Zion Hill Baptist Church in Bladenboro. A private burial will be held at a later time. In lieu of flowers, memorial donations can be made to Zion Hill Baptist Church 12418 NC Highway 131 North, Bladenboro, NC 28320 or Lower Cape Fear Hospice 206 Warrior Trail Whiteville, NC 28472. Add your thoughts, prayers or a condolence to Lynard's guestbook.